Farmscapes Game - Download and Play Free Version! Tom has been looking forward to three solid months of distraction free gaming, but his parents have other plans. Worried that their teenager might be spending too much time playing computer games, they ship Tom off to stay with his grandpa all summer long. Luckily for him, he was able to bring one friend along to make the transition to rural living easier. That friend is you! 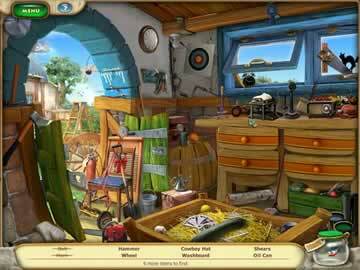 Farmscapes is a combination of match 3 puzzle action, hidden object puzzles and an interactive storybook. This winning blend of elements keeps things fresh and interesting. You never know what will happen next! The match 3 puzzles in this game are both fun and challenging. Simply matching 3 of the same object isn't enough to clear most of these puzzles. There are often items on the game board that are frozen in place and other items may be trapped by wooden crates that must be broken. The only way to remove these objects is to make them a part of a match. This requires planning and forethought. Solving these match 3 puzzles takes some time and effort, making them a satisfying challenge! The hidden objects in this game are varied and excellent, putting observation skills to the test! As the storyline progresses, players will encounter many surprising minigame tasks that are inventive and unique. Protect your farm from the plans of a greedy land developer or give some honey to a bear in need. A farmer's work is never truly done! 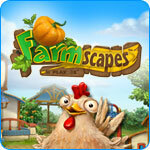 Farmscapes offers two different gaming modes. In relaxing mode, there is no time limit and players can focus on meandering through the game at their own pace. The timed mode pits players against the clock in order to turn up the challenge. Switching back and forth between the modes is easy and can be done at any time during gameplay. Farmscapes is a game with breathtaking graphics and stunning sound. The loading screen, cutscenes and gameplay feature graphics and animation that are top notch, and the sound effects will have you believing that you're really down on the farm. Farmscapes delivers a relaxing and immersive gameplay experience, every time. Spend the money you've earned on fantastic upgrades for your farm. Both useful and functional, farm upgrades allow you to build a farm that's totally unique and customized to suit your tastes and vision. Newspapers and letters serve as a reward for working through the game, and they let you get to know more about the setting and characters living in the world of Farmscapes. The decisions of the local townspeople have an impact on your farm just like they would in real life. 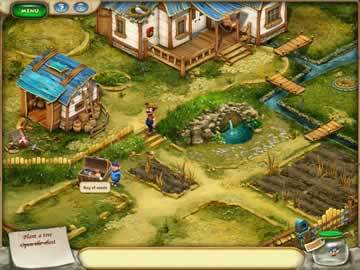 Farmscapes is a game that will appeal to puzzle fans of all ages and persuasions. If you have a hard time deciding between hidden object puzzles and match 3 games, this game was made for you!